Graduates from Samford University’s School of the Arts and Orlean Beeson School of Education were encouraged to step out in faith as they purse their callings and watch the connectivity between faith, passion and work come to fruition in their lives. 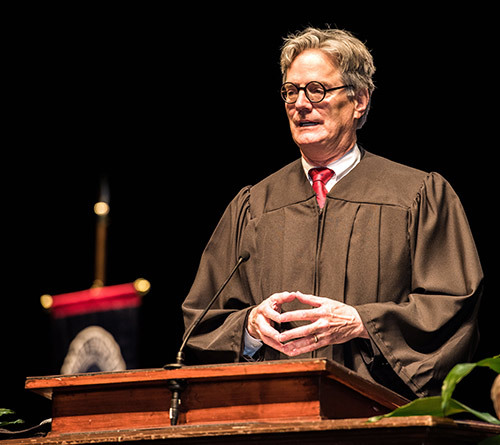 Neil Davis of Birmingham-based Davis Architects reflected on his journey and passion for architecture during an address May 13 in the seventh of Samford’s spring commencement ceremonies. He shared that at the age of 6 he was falling behind in reading but simultaneously discovering perspective drawing. “I consider dyslexia one of the many blessings of my life. I believe having a challenge to work through is where passion begins,” said Davis. He explained that he mentioned his dyslexia diagnosis because he feels it frames his life. “I believe that God has a purpose for me, and he created the passion that I feel for my work because that passion stems from two things dyslexia could not take from me: my creativity and intellect,” said Davis. His deep love for art and design began at an early age, “I designed my first house at the age of 5,” said Davis. Both of his parents and both siblings are architects. The Davis company developed the original master plan for Samford’s current campus and designed most of its buildings. He studied the rules, orders and elements of Georgian architecture. “The most satisfying moment in my research and associated creative process was realizing that yes, there are rules for classical architecture, but the art is when you know them well enough to know which ones to break and when,” said Davis. Buildings on Samford’s campus that Davis has designed include the Dwight M. and Lucille S. Beeson Center, Divinity Hall, Andrew Gerow Hodges Chapel, William Self Propst Hall, Jane Hollock Brock Recital Hall and Cooney Hall. His father designed Harwell G. Davis University Library, Frank Park Samford Hall, Leslie S. Wright Fine Arts Center, Reid Chapel and Crawford Johnson Hall—which Davis later transformed into Divinity Hall and Andrew Gerow Hodges Chapel. After introducing Davis as the speaker, School of the Arts Dean Joseph Hopkins asked him how long his family has been part of the Samford story. Davis replied it has been 79 years. He told the audience his earliest memory of Samford’s campus was a “pile of dirt,” referring to the construction of the current campus. Davis told graduates that he believes faith, passion and work are interconnected. “Have faith in yourself. There are challenges ahead every bit as big as the ones you’ve already faced, maybe bigger,” said Davis. “With your faith, know you are not alone. You may have to work at it, but that is where you will find the passion. Passion is the reward of faith and work.” He encouraged graduates that God will be with them along the way. The School of the Arts awarded 63 degrees, including 16 Bachelor of Arts, 25 Bachelor of Fine Arts, 13 Bachelor of Music, five Bachelor of Music Education, three Bachelor of Science and one Master of Music Education. Orlean Beeson School of Education awarded 141 degrees, including 40 Bachelor of Arts, one Bachelor of Science, 42 Bachelor of Science in Education, 41 Master of Science in Education, nine Educational Specialist and eight Doctor of Education. Kristen Fuller, an early childhood/special education/elementary collaborative education major, received the President’s Cup. This award is given to the graduating student with the highest grade point average across all Samford colleges and schools. The John C. Pittman Award is named for an alumnus and longtime trustee, and is awarded to the graduating student who most consistently exhibits exceptional Christian character and community life. The 2017 recipient was School of the Arts senior Katheryn Lamb. Lamb also received the Velma Wright Irons Award, which is given to the graduating student with the second-highest cumulative grade point average across all campus colleges and schools. Samford President Andrew Westmoreland thanked family and friends of the graduating class for their support and sacrifice to make this day possible. He also congratulated the class and affirmed that the Samford community would be cheering them from “this Alabama hillside” as they move through this next chapter of their lives. The ceremony concluded Samford’s 175th anniversary year of celebration.